The laws pertaining to ownership of the American alligator (Alligator mississippiensis) vary from one location to the next. Some areas allow anyone to own an alligator, while others require residents to obtain a permit before acquiring one; still others ban their ownership entirely. Regardless of the legal environment that governs your jurisdiction, alligators are extremely dangerous animals. And although they are important components of their natural habitats, which should be revered rather than feared, large crocodilians can easily kill an adult human. Only those with the proper training, knowledge and experience should maintain these gigantic predators. Alligators receive federal protection in the United States. But the U.S. Fish and Wildlife Service allows states to implement their own management and control programs, so the laws regarding ownership vary from state to state. 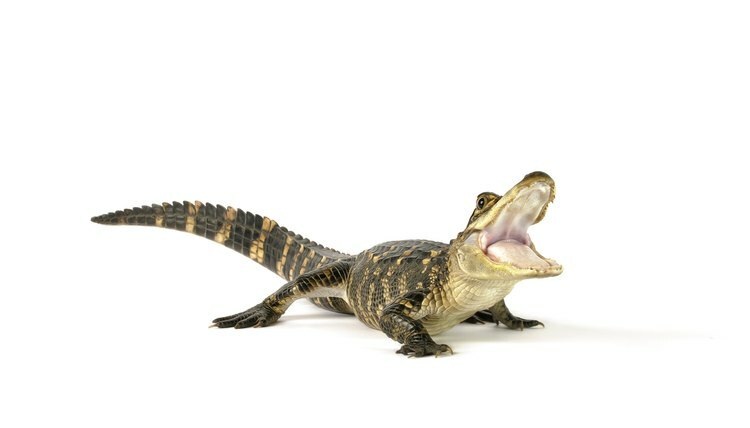 Inquire with your state’s wildlife or natural resources department to find out if alligators are legal pets in your state and if permits are required. You must also check to make sure your city and county allows exotic pets, such as alligators and other crocodilians. Expect regular -- potentially unannounced -- inspections from all agencies from which you must obtain a permit. There are no “dwarf” alligators. Females average about 8 feet in length upon maturity, but males may reach more than 12 feet in length and approach 1,000 pounds in weight. Accordingly, they require gargantuan enclosures that feature both land and water sections. According to the recommendations in a 2013 publication by the University of Florida's Institute of Food and Agricultural Sciences, enclosures for mature crocodilians should be twice as long and wide as the animal's length. For example, even an 8-foot-long female requires a 16-by-16 enclosure. About one-half of this space should feature a pond deep enough for the animal to submerge completely. Because of their immense bulk and incredible strength, you must construct the cage from resilient materials, such as concrete blocks, poured concrete and chain-link fence. As alligators are often housed outside, it is imperative that the cage not only keeps the animal inside, but that you ensure unauthorized people cannot get into the cage. Providing a suitable enclosure for your alligator is challenging enough, but you must also consider the ongoing maintenance needs of your new pet. Keeping the enclosure and pond clean will require considerable amounts of labor, and ideally, the installation of a drainage system for the pond. You may also need to include heat lamps if the local temperatures are not appropriate. Feeding your alligator will also present problems. While it may be easy enough to obtain feeder fish, crickets and rodents to feed a young alligator, feeding an adult is an entirely different matter. As your alligator grows, you will need to find a source for rabbits, nutria, chickens or similar food items. Some municipalities have liability insurance requirements for citizens who own exotic animals, such as alligators. While you can check with your local wildlife department to find out if such insurance is legally mandated, it makes good sense to acquire a suitable policy, even if you are not legally bound to do so. Contact a licensed insurance agent in your state and discuss your exposure level and what type of policy is best suited for your circumstances. You may have to spend a great deal of time searching for an insurance company that offers an exotic animal policy, so inquire with local pet stores, petting zoos and veterinarians to generate leads. Catching a baby alligator from the wild is illegal without permits; it is also incredibly foolish. Like many other crocodilians, female alligators are good parents who vigilantly guard their offspring. Further, wild caught reptiles are typically stricken with pathogens and parasites. These infections and infestations often become markedly worse during the process of capture and acclimation. If you decide that an alligator is the right pet for you, obtain a captive bred hatchling from a reputable breeder. Lawyers.com: When Your Pet Attacks, Are You Liable?